I was really pleased to have been invited to the recent Tadiran Batteries International Sales Conference held in Israel. It was my third visit, they hold the conference every five years and it is a fantastic opportunity to meet up with old friends and colleagues from all over the world and to catch up with product developments. The family atmosphere that has been generated makes it easy to see why Tadiran Batteries are such a force in the battery market. They have been specialists in the Lithium Thionyl market for well over 40 years. All of their claims for batteries lasting 25 years are born out of real lifetime tests, both in their labs and with their customers. It will not be long until the 30 year claims will be made. This year was particularly great for me personally because during one of the presentations they flashed up my image and described me as the “The Father of the British Gas Project”. They have a great way with words – what they meant was that they were thanking me for my involvement at the very beginning of this project, some work that originally started over 20 years ago. I was part of the team that initiated the work and that’s exactly what it was, teamwork. The above image was a photo opportunity that Geoff Ramm would have been proud of. 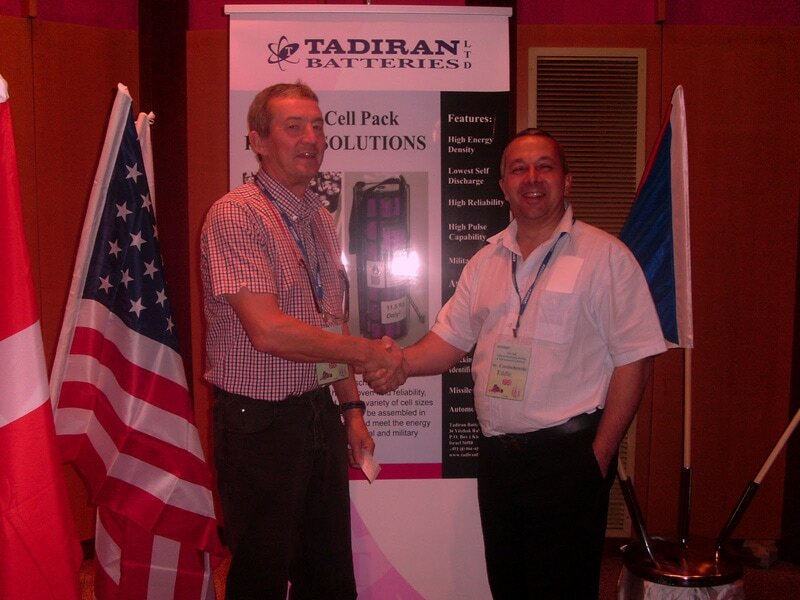 It is of me and Les (UK Sales Manager for Tadiran Batteries) standing in front of one of the banner stands at the conference. Careful positioning shows our company name being proudly displayed in the background. Yes I know, simple things please simple minds, but I could not resist it. If I personally had to sum up Tadiran in 3 words I would say Quality, Family and Amazing.